We’ve all seen when the police bring the heat down on the mob they would go to mattresses. These always seemed to be on a floor in some old vacant building or when a concerned parent of a small toddler worries about a child falling out of bed places the child’s mattress on the floor hoping to prevent a fall. In both these cases mattresses are simply laid upon the floor for someone to sleep which got us to wondering is this a good thing to do since mattresses usually come with boxsprings? So today’s question are there special kinds of mattresses that don’t require box springs or can any mattress be used by its self? We believe that most mattresses shouldn’t necessarily require box springs. 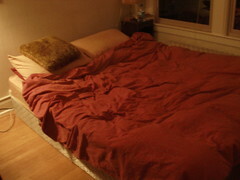 Below we have shared some important information that supports both when a mattress needs and doesn’t need a boxspring. There are many beliefs which we are going to cover so please feel free to share your comments, concerns, and experiences below in our comment section. Mattresses don’t last as long without boxsprings- For years the base support of a mattress was considered the boxspring. Because this supporting base included springy coil springs heavier than those used in the mattress it was believed to absorb energy and prolong mattress life. Boxsprings give the bed extra height and elevation- When using a headboard or a head and foot board something was needed to not only support the mattress and keep it from falling through the bed but to raise it making sitting and getting in and out of bed a more pleasant experience. Without the additional height beds tend to sit very low and are hard for some people to get out of. Steel Bed Frames will not support mattresses without box springs- Mattress by themselves are very flexible and pliable and uneven. Mattresses have no ridged structure to keep them from falling through a bed frame including those with center support. Bed frames offer a structural frame parameter rail and in many cases extra support in the middle that work in conjunction with a boxspring to support the mattress. Boxsprings increase overall mattress support- While this seems to make sense and has been the sales pitch for years; I find it interesting that the sales pitch seems to be changing. Most boxsprings don’t have springs in them anymore: They are solid and do not flex making them no different than laying the mattress on the floor or a platform bed. Many stores now sell platform beds: These are often beds that include a headboard and a ridged supporting structure that won’t allow a mattress to sag through eliminating the need for a boxspring. Doctors recommend Plywood- Physicians and even chiropractors have said for years that putting a board between the mattress matters and increases support for the back. While I have not personally seen a study showing more benefits of doing this, placing a mattress on the floor, a platform bed with good support, or even a foundation should not matter. for mattress manufacturers to make more money and perhaps it is, however manufacturers make the mattresses so they ultimately write their warranties. They get to determine what it is they want to stand behind if an issue was to arise including what is or isn’t proper support for “their” brand of mattress. It is very important to be sure and read your warranty card and completely understands what the builder of your mattress believes is best for your sleep system or you may find yourself sleeping on a mattress with no warranty if a problem were to arise.